“The rents nowadays are very unreasonable,” Lee said. “There’s no way for me to afford those residential units.” Another advantage: He’s able to store his photography gear and shoot pictures at home because of the generous space. This version of industrial chic is just another way Hong Kong residents are trying to beat the world’s most expensive housing prices, with the average home costing 19.4 times the city’s median annual income, according to Demographia. Sky-high prices have given rise to the micro-apartment and dormitory style “co-living” spaces. Demand for units smaller than two car-parking spaces has surged this year as costs continue their relentless climb. While the government has been reviewing 18 options to increase land supply in a bid to tame housing prices and avert social unrest, allowing people to legally live in industrial buildings isn’t on the list. Instead, proposals range from reclaiming more land near Victoria Harbour to building homes on top of a container terminal. Those risks were highlighted when a fire ripped through a unit in an industrial building in the New Territories in August last year, killing three people. The apartment was found to be one of 17 subdivided units on the floor. An estimated 12,000 people lived in industrial buildings in 2016, according to the Society for Community Organization, an advocacy group. The organization hasn’t updated its estimate in recent years but expects the number to have dwindled due to heightened inspections by the government, according to Angela Lui, a community organizer at the group. While building owners and tenants are currently required to end any domestic use if found to be renting industrial buildings for residential purposes, the government last year proposed introducing criminal sanctions. The plan, if finalized, can be put forward for approval at the earliest in the coming legislative year starting in October. 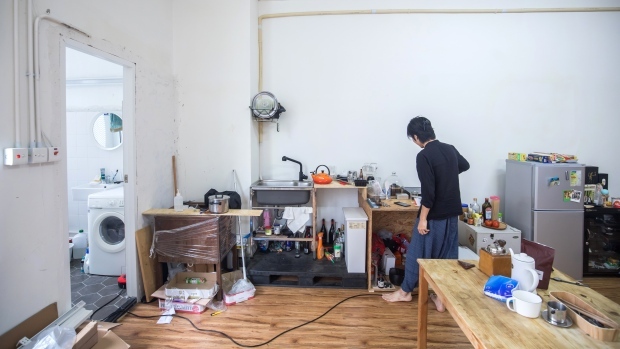 That hasn’t deterred 23-year-old Ting Li, who lives with her boyfriend in a 200-square-foot apartment inside an industrial building in Sha Tin. In addition to potential eviction, the couple has to deal with problems regular Hong Kong residents don’t come across. “The running water will somehow come out yellowy on the weekend, so we have to drink bottled water,” she said. Not only that, power occasionally cuts out after working hours, meaning the air-conditioning won’t operate in a city known for its hot and steamy weather. But the young couple aren’t planning on moving out anytime soon, as they pay just HK$5,000 (US$637) a month rent, or just 15 per cent of their combined income. Getting a residential apartment elsewhere would chew up 40 per cent of their wages. “I have looked into other places in residential areas, but they are too expensive,” she said.